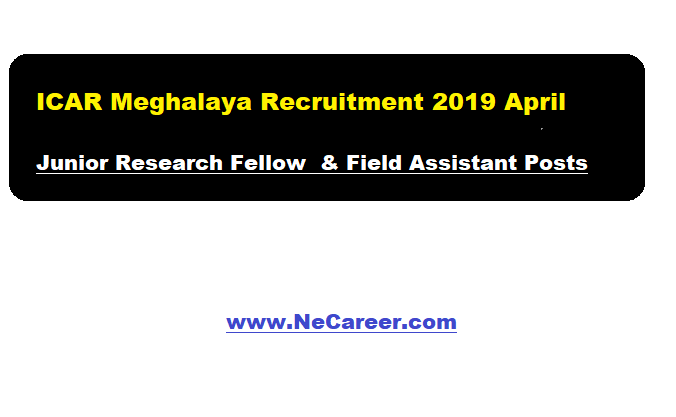 ICAR Meghalaya Recruitment 2019 April - Junior Research Fellow & Field Assistant Posts:- Welcome to North East India's No. 1 Job Portal NeCareer.com . Indian Council of Agricultural Research (ICAR) Meghalaya has issued a job notification in April 2019. According to the recruitment, ICAR Research Complex for N.E.H. Region, Umiam, Meghalaya invites eligible applicants for Walk-In-Interview to be held on 22nd April 2019 (Monday) at 11:00 am in the Division of Horticulture, ICAR Research Complex for NEH Region, Umiam-793103 for the posts of JRF and Field Assistant. Master’s Degree in Life Sciences with specialization in Plant Biotechnology with NET qualification. Desirable Qualification: Experience in molecular work and statistical analysis survey and collection. Essential Qualification: Candidates must have B. Sc. (Agriculture/ Horticulture/ Life Sciences). Desirable Qualification: Knowledge of computer & Khasi language. Age Limit : Upper age limit is 35 years for men and 40 years for women candidate. Age limit will be relaxed for SC/ST/OBC as per Govt of India/ICAR Norms. Interested eligible candidate may appear in walk-in interview at the mentioned location. Candidates should bring an application with full bio-data addressed to the Director, ICAR Research Complex for NEH Region, Umiam-793103, Meghalaya enclosing photocopies of certificates and mark sheets from HSLC onwards duly attested. A recent passport size photograph should also be affixed on the top of the application. Interview Date : 22-04-2019 from 11 A.M.